The client is a global provider of industrial air pollution control systems. The client is in to design, manufacturing, servicing and installation of such systems. The client designs, manufactures, services and installs thermal and catalytic oxidation technologies as well as heat recovery systems for a variety of applications and industries. A detailed three-dimensional (3-D) finite element (FE) computer model was to be utilized for seismic qualification analysis of the Regenerative Thermal Oxidizer manufactured by the client. 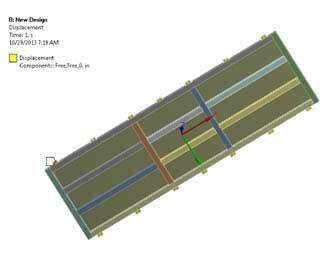 This was a big challenge for our FEA experts. The analysis was performed to determine structural integrity and performance characteristics of the Regenerative Thermal Oxidizer Base under different seismic loading condition. This required lot of dedication and hard work from our FEA experts. After understanding the needs of the client it was decided to use ANSYS v14.5 Mechanical software to resolve the problem. Modal Analysis was carried out to extract first Natural Frequency of the RTO System Base. A Block Lancoz algorithm was used to find the first fundamental natural frequency. Seismic Analysis was performed using an Equivalent Static Analysis loading case. For this, the First Natural Frequency found out using Modal analysis was used in connection with the Spectrum to be analyzed for. The results obtained indicated that the RTO base of the client is safe under the conditions applied and used. The stresses produced under conditions were compared to the SSE allowable values and all components are safe from a strength point of view. The stiffened design of base ensures that the Base shall sustain the Loading during the specified Seismic Event. The client was satisfied with the results and wished to associate with Hi-Tech in near future.